I made my continuous loops and installed them in the end channels of my hammock. I installed my cinch buckle on my loop thusly (and no, I don't have pictures yet): push loop through one side of buckle and then thru itself again, then up and over the cinch buckle. So it's attached but I really only have one wrap worth of the amsteel on either side of the buckle. I ran my webbing strap thru the cinch buckle and hung up my hammock. 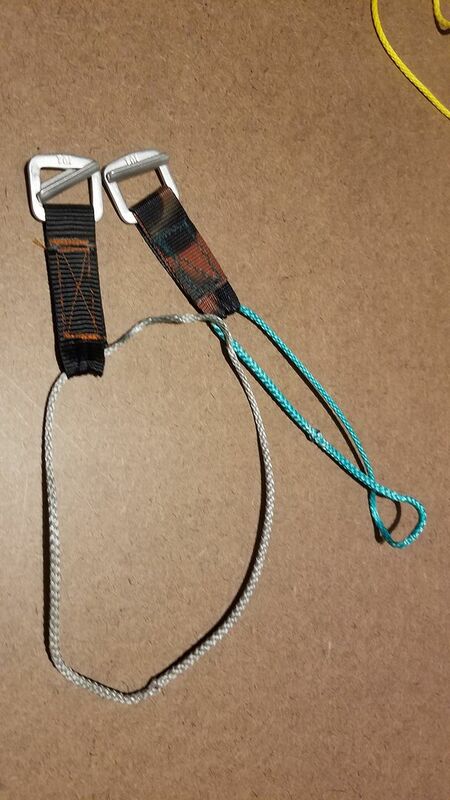 I sat down in the hammock and as soon as I loaded it with weight, the cinch buckles shifted to where the amsteel loops were now in one corner and the webbing straps were in the opposite corner. I got up immediately after I heard the pop. I looked at my straps and one of them was ripped on the edge where it got punched in the corner of the cinch buckle. What did I do wrong??? I can't get any more wraps worth of amsteel on the cinch buckle (like the ones shown when you buy the whole kit from Dutch) because I only made 8" loops. Is that my problem??? Can this be salvaged by making longer loops and therefore getting enough wraps in the cinch buckles that the amsteel goes from one side to the other? Does that make sense? Was hoping to use this new setup on a trip tomorrow but it looks like I'm back to atlas straps for that. KINGLONESTAR wrote: I made my continuous loops and installed them in the end channels of my hammock. I installed my cinch buckle on my loop thusly (and no, I don't have pictures yet): push loop through one side of buckle and then thru itself again, then up and over the cinch buckle. So it's attached but I really only have one wrap worth of the amsteel on either side of the buckle. I ran my webbing strap thru the cinch buckle and hung up my hammock. Yep, that's pretty much it. That's zackly what I did the first time. Ten inch loops might work, twelve inch mo bettah. You need to have that whole space filled up. Drat! Thx for the quick reply. Shut the front door, Alice Brown! BREEELYUNT! KINGLONESTAR wrote: I got up immediately after I heard the pop. I read this earlier today and didn't really think about it again. My new Dutch bling came today (cinch buckles) so I was putting it on the hammock and when I laid down in it I heard this huge pop and this immediately came to mind. I jumped up (well as fast as one can jump in an HH classic entry) and checked it out. I think I just had my webbing strap twisted because when I fixed it I didn't hear it again. I am really digging that webbing sewn on the buckles though. That's a good way to go. Hey Scuba, does the loop degrade the strength of the strap in any way where it kind of pinches the strap down. I'm also wondering if the straps being bunched up there weakens their holding capacity. I sewed them up anyway but I'll be looking for signs of degradation in the straps. used that pair more than 60 nights with no ill effects. Good to know! Thanks again.